Institute The Institute of Discrete Mathematics and Geometry has the number 104 (or E 104) which is also part of our mailing address. We encourage you to visit the Institute via public transport. Underground Lines U1, U2, and U4: Karlsplatz station - 5 minutes' walk. Tram Lines 1 and 62: Resselgasse - in front of our building. 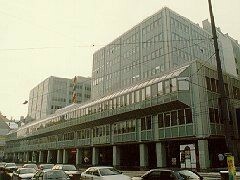 Interurban Tramway Vienna-Baden (WLB - Badner Bahn): Resselgasse - in front of our building. Tram lines 2, 71 and D: Kärntner Ring, Oper - 10 minutes' walk. Bus 59A: Bärenmühlendurchgang - 2 minutes' walk. Bus 4A: Karlsplatz - 5 minutes' walk. Bus 2A: Kärntner Ring, Oper - 10 minutes' walk. A car park (fee) is in our building (WIPARK Garage Technische Universität, access from Operngasse 13). Notice: Parking tickets are required everywhere in the city centre, except for night time and weekends. Copyright © 1996-2017 by Differential Geometry and Geometric Structures. All rights reserved. Last modified on April 22nd, 2017.